Carter at the tomb of Tutankhamen. 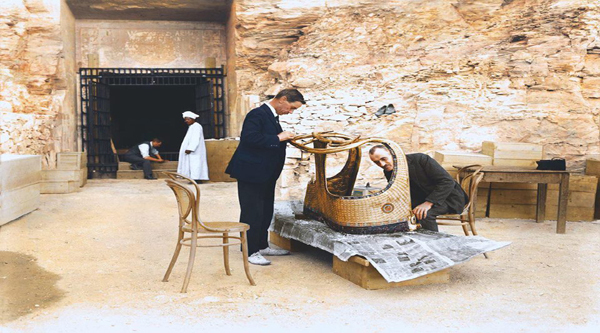 Carter at the coffin of Tutankhamen. Discovery of the tomb of Tutankhamon. Tomb of King Tut discovery. Findings inside the Tutankhamon tomb. Tomb of Tutankhamon inside when just discovered. Different staff found inside the tomb. Collection on Tutankhamon belongings from the tomb. The tomb of boy king Tutankhamun (KV 62) was uncovered on November 4, 1922 by Haward Carter. Here is how he described the discovery: "All next day we worked at high pressure, and were long uncovering what proved to be a sunken staircase cut in the living rock of the valley's bed. The deeper we descended the more evident it became that a find of importance was before us. It was late in the evening when a doorway , blocked and sealed, was disclosed. The seals were those of a king - King Tutankhamun! And then beyond all doubt we knew that we were on the edge of a great discovery. I spare you my feelings!" The first step of the staircase leading down to the tomb of the boy-king was uncovered beneath the foundation of Ramessid workmen's huts near the entrance to the tomb of Ramesses VI. "At first I could see nothing, the hot air escaping from the chamber causing the candle flame to flicker, but presently, as my eyes grew accustomed to the light, details of the room within emerged slowly from the mist, strange animals, statues, and gold "everywhere the glint of gold". With the discovery of Tutankhamun's tomb it was possible to see for the very first time the riches of an Egyptian royal burial. This famous tomb is among the smallest in the Valley of the Kings. Nevertheless it contained treasures which may have represented the most abundant hoard ever buried in the valley. The five thousand-odd objects catalogued from the tomb represent a uniquely accumulated collection and, perhaps, the richest placed in any tomb. Among the spectacular findings was the gold life-size mask of excellent workmanship. It protected the head of the mummy of Tutankhamon. The mask weights 11 kg and is decorated with lapis lazuli, carnelian, quartz, obsidian, turquoise and coloured glass. His gold coffin is decorated with semi-precious stones and glass weights 110.4 kg. The mummy of Tutankhamon was found in the gold coffin, placed inside two larger wooden coffins, richly gilded and ornamented with semi-precious stones and glass. The three coffins were placed in a rectangular quartzite sarcophagus with a red granite lid. Over and around sarcophagus, again placed one inside the other were four gilded wooden chapels which almost completely filled the sarcophagus chamber. The two inner coffins are now on display in The Egyptian Museum of Antiquities . The third outermost coffin was left in his tomb containing the king's mummy. 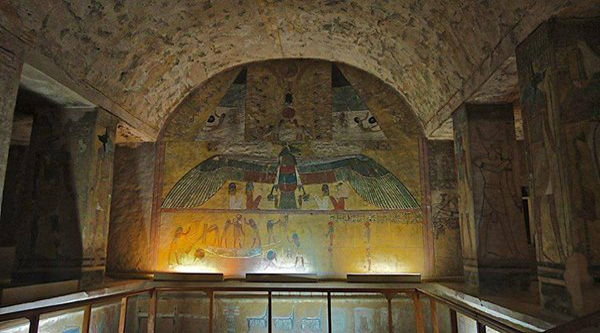 The burial chamber was originally sealed off by a plastered wall, before which stood two life-sized statues of Tutankhamun in dark varnished wood, with gold ornaments, headdress and kilt. When the wall was broken through, the outermost shrine of wood, covered with gold-leaf, was revealed. Within it were 3 similar, smaller shrines, one inside the other. The sarcophagus of crystalline sandstone lay at the centre.